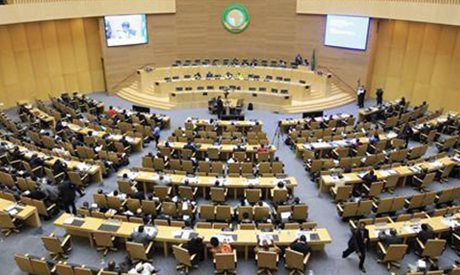 The African Union's Peace and Security Council has unanimously agreed to unfreeze Egypt's membership to the AU, state news agency MENA reported on Tuesday. The decision comes after almost a year of Egypt being suspended from the 54-nation bloc just days after the overthrow of president Mohamed Morsi, citing a need to restore "constitutional order". It is the AU's policy to suspend any member state that undergoes an "unconstitutional" change of government. However, in April – a few weeks before the presidential election which brought Abdel-Fattah El-Sisi to power – AU head Nkosazana Dlamini-Zuma said that Egypt would return to the union after the implementation of its transitional roadmap. Egypt has so far finalised two out of three milestones of its post-Morsi roadmap, ratifying a new constitution in January and electing a new president in May. The last step is the election of a parliament, the procedures for which must commence before 17 July, according to 2014's amended national charter. On Sunday, El-Sisi was invited to attend an extraordinary African Summit taking place in Ouagadougou on 6-7 September. Egypt has always been and will remain forever the leader of Africa .. Thank you President Sisi and Minister Fahmy .. you gave back to Egypt its honor and pride..
Congratulations to our Egyptian brothers and sisters to be member of AU again, but let me tell you Mr. Kariman you never be the leader of Africa, however if you think you were the leader of Africa ..please forget your day dream ...now the black lions back on truck...now it is the time of Ethiopians, the crown is on the top of our head, if you try to catch ...the crown is made up of fire. wish you good governance for the people of Egypt. Egypt is the Cown Jewel of Africa, the birth place of human civilization and even organized religion. Africa is open for investment and technological development. We can work together for better life and protection of Africa from exploitation. Thanks Mr. Fahmy our shining star. Allah AKber.